The latest Name the Bug challenge has been successfully identified as Apalopteron familiare, the Bonin honeyeater. I'll put up a descriptive post for that species in the next few days, but for now it's Taxon of the Week time. A fantastic shot of the clausiliid Cochlodina laminata by Dietrich Meyer. The shell of this individual was 17 mm long. 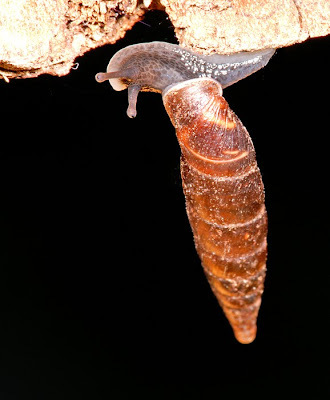 The new Taxon of the Week is a repeat performance - Clausilioidea or door snails were featured here earlier this year and I'd recommend reading that post before this one. As mentioned there, one of the characteristic features of Clausiliidae (the family including all living clausilioids) is that they have very narrow, tall shells. Cain (1977) found that the distribution of shell shapes among terrestrial snails tended to be bimodal - shells were usually very long and thin or short and flatter, with very few being only slightly elongate. At least one factor in this difference in shell shapes appears to be choice of feeding territory* - elongate snails prefer grazing on very steep or vertical surfaces while shorter snails prefer more horizontal surfaces (Goodfriend, 1986). Studies on the behaviour of the clausiliid Cristataria genezarethana by Heller & Dolev (1994) found that they spent most of their lives sheltering in crevices - an individual snail would only be active for about six to twelve days of the year. Growth was estimated to be correspondingly slow - it may take eleven years for a Cristataria to reach maturity. *In discussing possible reasons for the bimodality of shell shapes, Cain (1977) provided a very pithy summary of the problem in studying snail behaviour - "It is of course true that most species of snail when active are nocturnal or at least crepuscular, while conchologists are largely diurnal". 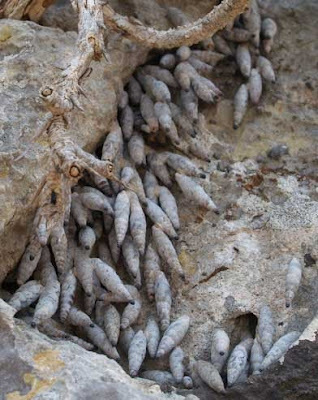 Congregation of aestivating individuals of the clausiliid snail Albinaria caerulea. This is one of the more widespread species of Albinaria, found in coastal western Turkey and the Cyclades islands of Greece, while an isolated population in Attica in Greece may have resulted from human transportation. Photo by Aydin Örstan. Perhaps the most extensively studied clausiliid group is the Mediterranean genus Albinaria, found in southern Greece and Turkey. Albinaria shows a high level of apparent diversity - over 200 species and subspecies have been described. Many of these taxa occupy highly restricted distributions, and sympatry within the genus is rare. However, narrow hybrid zones exist between many "species", and they can often be interbred readily in the laboratory (Douris et al., 1998), leading to the suggestion that the number of true species involved may be much lower and that many supposed "species" may instead represent ecotypes. Comparable patterns of diversity are known from other land snail genera; one of the most notorious examples is the West Indian genus Cerion, the taxonomy of which was an early research topic of Stephen Jay Gould and a strong influence in the development of his opinions on developmental constraints and evolutionary contingencies. Molecular studies of Albinaria have supported the recognition of certain species, but failed to distinguish between others (Giokas, 2000). In some cases, two morphologically distinct "species" might form a clade together but remain intermixed within the clade, suggesting that they are indeed ecological variants of a single species. Cain, A. J. 1977. Variation in the spire index of some coiled gastropod shells, and its evolutionary significance. Philosophical Transactions of the Royal Society of London Series B - Biological Sciences 277 (956): 377-428. Douris, V., R. A. D. Cameron, G. C. Rodakis & R. Lecanidou. 1998. Mitochondrial phylogeography of the land snail Albinaria in Crete: long-term geological and short-term vicariance effects. Evolution 52 (1): 116-125. Giokas, S. 2000. Congruence and conflict in Albinaria (Gastropoda, Clausiliidae). A review of morphological and molecular phylogenetic approaches. Belg. J. Zool. 130 (Suppl. 1): 93-100. Goodfriend, G. A. 1986. Variation in land-snail shell form and size and its causes: a review. Systematic Zoology 35 (2): 204-223. Heller, J., & A. Dolev. 1994. Biology and population dynamics of a crevice-dwelling landsnail, Cristataria genezarethana (Clausiliidae). Journal of Molluscan Studies 60 (1): 33-46. I don't have Heller's paper in front of me, but I think the snail they studied, Cristataria genezarethana, lives in a desert-like habitat, which is why the number of active days/year & its growth rate are so limited. Elsewhere, for example, in western Turkey, Albinaria reaches maturity within a year or two. Some clausiliids, for example, Bulgarica, despite having tall & skinny shells, actually live on the soil surface & don't necessarily graze on vertical surfaces. So, the correlation between shell shape & feeding is not very strong. "It is of course true that most species of snail when active are nocturnal or at least crepuscular, while conchologists are largely diurnal". Sounds like conchologists should employ more grad students. Thanks, Aydin. I was able to access the abstract of Heller & Dolev's paper, but a subscription wall kept me from the full article. A certain degree of knowledge about activity regimes in arid-zone snails would probably be helpful to me, though, because collecting arid-zone snails is currently part of What I Do. And can you confirm that clausiliids on horizontal surfaces drag their shells along the ground behind them rather than holding them upright? I believe I read something to that effect in one of the articles I looked at, but I wasn't sure if I'd understood it correctly.